Ba naomh é Proinsias Xavier (7 Aibreán 1506 – 3 Nollaig 1552). Bascach as Navarre a bhí ann. Duine den chéad seachtar Íosánach ab ea é. Thaistil sé go tíortha an oirthir - an India, Srí Lanca, Malacca, na Moluccas agus an tSeapáin – ag craobhscaoileadh an chreidimh Chríostaí. Rugadh Proinsias i gCaisleán Xavier i dTír na mBascach i dtuaisceart na Spáinne, gar do Sangüesa ar an gCamino Aragonés. Is ionann an focal ‘xavier’ agus ‘teach nua’ sa Bhascais. 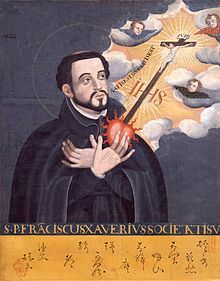 Bhí aithne ag Proinsias ar Iognáid Loyola agus bhí sé ina bhall de Chumann Íosa. Chuaigh Xavier chun staidéar a dhéanamh i gCollège Sainte-Barbe i bPáras. D’éirigh go maith le Xavier ina chuid staidéir, agus ba churadh na hollscoile é sa léim ard. Iompaíodh a shaol bun os cionn, áfach, nuair a tháinig scoláire Bascach eile, Iognáid Loyola, chun cónaí in aon lóistín leis. Ar dtús, ní raibh suim dá laghad ag Xavier san fhear nua a bhí bacach ó gortaíodh é ag Cath Pamplona ocht mbliana roimhe sin. Mar a tharla bhí beirt deartháireacha de chuid Xavier ar an taobh eile sa chath sin. I ndiaidh tamaill bhig chuaigh Iognáid i bhfeidhm ar Xavier. D’éirigh dlúthchairdeas eatarthu. Bhunaigh Xavier agus Loyola Cumann Íosa le chéile (in éineacht le Peter Faber agus fir eile). Scaip sé an Chríostaíocht san Áise, go mór mhór san India. Ní raibh fios ar bith ag muintir na hEorpa faoin Seapáin go dtí gur scríobh Proinsias Xavier litir ‘na bhaile ón tír sin. Níor chaith Xavier ach deich mbliana ‘ar na misin’. Ar 7 Aibreán 1541, chuir Proinsias chun na farraige ó Liospóin, agus é ag dul mar ionadaí an Phápa chun na hIndia. Nuair a shroich Xavier an t-oirthear chuala sé faoin tSeapáin den chéad uair agus chuaigh sé ar aghaidh ansin. Nuair a labhair sé faoi Dhia leis na Seapánaigh, d’fhiafraigh siad de cad chuige nár chuala na Sínigh faoin Dia seo más fíor-Dhia a bhí ann. Mar sin, rinne Xavier cinneadh go mbeadh air bualadh leis na Sínigh. Bhí Xavier ar oileán Sancian, beag amach ó chósta na Síne. Bhí sé ag fanacht le long chun é a thabhairt chuig mórthír na Síne. Ach bhuail fiabhras é. Fuair Xavier bás ar 3 Nollaig 1552. Níor chaith sé ach deich mbliana ‘ar na misin’, Ach leag sé amach cosán a thabharfadh inspioráid do na mílte fear agus ban a leanfadh a chéimeanna chun an Soiscéal a thabhairt chun na hÁise. Rinneadh Xavier agus Loyola a chanónú le chéile ar an aon lá, 12 Márta 1622. Cé gur cuireadh é in aol beo, fuarthas amach go luath gur fhan a chorp gan lobhadh. Coinníodh a chorp i nGoa na hIndia. Déantar é a nochtadh do na milliúin oilithreach gach deich mbliana. Tugadh an leathanach seo cothrom le dáta an 3 Márta 2018 ag 18:02.